Generic Company Place Holder Colors! Originally released two years ago for the Nintendo DS, the painting app Colors has an established user base, complete with its own vibrant online community creating a gallery of amazing paintings. It was a no-brainer, then, that developer Collecting Smiles would bring the app to the iPhone and iPod touch. Unfortunately, the app suffers from a few shortcomings that limit the fun—at least for me. Color Me Frustrated: Colors has many things going for it, but the painting app can be a little clunky and somewhat frustrating, with an unresponsive undo command and jerky zooming. Colors comes loaded with four brushes that can be both hard or soft edged. You can adjust the size of the brushes to your liking; transparency is adjustable as well, which you can change on the fly by tilting your mobile device. You can paint in virtually any color using the wheel-style color picker, or use the app's eye dropper tool to select any color from the canvas. Colors has a generous undo/redo stack, though I found it unresponsive or slow to process at times. You can also replay your painting stroke by stroke within the app. The options menu in Colors lets you flip your painting either vertically or horizontally. You'll also find a setting that offsets the brush cursor, so your finger isn't in the way when you paint. You can export paintings, either via e-mail or to your camera roll, in resolutions up to 1,280-by-1,760. Tapping the Gallery button will connect you to the Colors gallery where you can view other artists paintings or upload your own. (Note that a free version of Colors, also available from the App Store, won't let you save paintings or export them to a gallery.) You can even watch a replay of the paintings to see how the artist created them. The gallery and community of artists that surround it is Colors' greatest strength. The app itself, however, doesn't measure up. I found Colors a little clunky and somewhat frustrating. Between the slow or unresponsive undo and the jerky zooming (done with the pinch gestures), using Colors was not always an enjoyable experience. 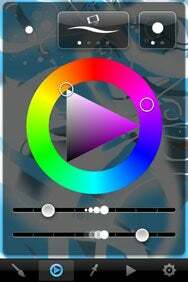 The free Colors Lite gives you the opportunity to test out the app's controls before committing $5 to the full version. This is a case where test-driving the free app is a wise move. Colors is compatible with any iPhone or iPod touch running the iPhone 3.0 software update. Colors Lite runs on the iPhone 2.1 software.